Winter is coming. 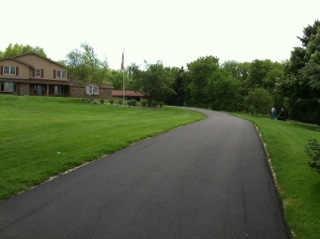 Is there still time to get your asphalt driveway seal coated? Autumn is well upon us, and winter isn't far away, so here at Wolf Paving we wanted to remind everyone that there's still time to seal coat your asphalt driveway ahead of winter... but not much of it. We've been getting a lot of questions lately, like “Do I still have time to seal coat?” or “How warm does it have to be for seal coating to set?” Plenty of people realize it may be time to apply a new coat to their asphalt, and we've been hearing a lot about it. So much, in fact, that we're already booked solid through the end of the season! If it's been more than three or four years since you last seal coated your asphalt driveway, it may be time for a new coat before the weather turns too cold. However, sooner is definitely better than later in this case. For a proper curing, seal coat needs a nightly temperature of at least 50 degrees. However, falling leaves also present a problem as they will become embedded in the seal coat if they fall during its drying process, weakening it as well. So, as a rule of thumb, seal coating season is at an end when the autumn leaves begin to fall. That said, there's definitely still time to get in some crack-filling. That can be easily done yourself with supplies you can pick up at most large hardware stores. It's a quick and painless job that will, at least, ensure that further damage to your asphalt driveway is minimized during the spring thaw. While we still recommend those with cracks developing try to get their asphalt seal coated before it gets too cold, spring is really the best time for seal coating. It means your driveways and parking lots look great for the entire year, and warm spring weather is the perfect temperature for a well-set coat. Plus, a fresh seal coat is easily damaged by winter machinery, like snow plows. So please take care when using these, or you could end up having to re-seal your asphalt once the snows melt. Either way, if there's a spring seal coating ahead, we recommend contacting us ahead of time, so you can take care of any damage to your asphalt as quickly as possible once it thaws.